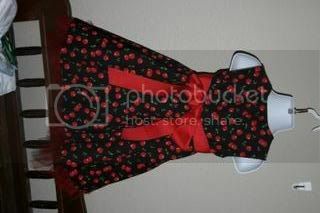 Dresses, Shorts & MORE! – Everything Your Mama Made & More! I haven’t posted in a while… Its been a long few weeks & its probably gonna be a few longer! Well I got a little distracted this month. My Grandmother has small cell lung cancer & around Valentines day took a turn for the worse. Then last weekend my Grandfather passed… & the next day I found out my grandmother will no longer be getting treatment for her cancer. We are having my Grandfathers services & Celebration of Life tomorrow so I have been busy all week. On the plus side the last few nights Brian has made me take some time to myself to sew!!! I think that is the only thing that has kept my sanity. With all this things for my stash sewing game didn’t go as smoothly as I planned, though I shattered my 500 point original goal & flew by my 800 point second goal, & it was all personal stuff (no business sewing, which is what some of the mamas do). 1033 was my total… puts me in the top 10 (of about 90) I think, or close to it I think isn’t bad for my first stash game with no business sewing. Anyways here are the things I have worked on the last 4 days that I started sewing again. Also Carlie pulled her self up to the coffee table for the first time today… I can’t believe my babies are getting so big!!!! 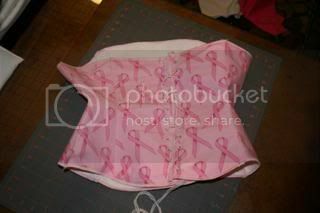 Breast Cancer Pink Ribbon Corset … nothing fancy, its my first attempt & I didn’t bother with boning, just multi layers with a thick middle layer. 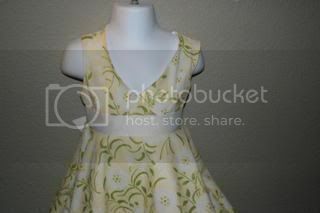 I made the pattern from scratch. The only thing I didn’t like when I was done is it reminds me I need to lose weight!!! 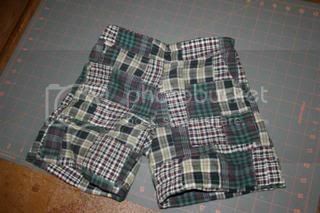 2T Girls Boxer Briefs with rolled hem on legs…. now I need to make Zander some! 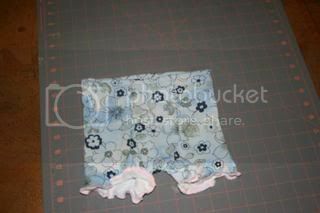 3t Patchwork Toddler Shorts I made this pattern from scratch & I am in LOVE with it! 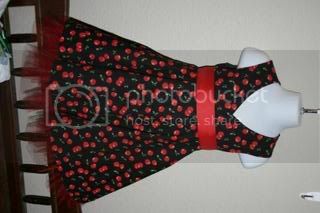 2 size 1T Cherries Twirly Dress… I HATE American patterns… this 1/2 size dress should be 6m… but I know they run HUGE so I figured it would be a 12m which was okay… NOPE! Its seriously a slim 2t!!! 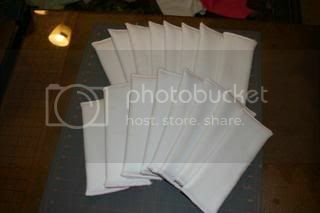 & I used the proper seam allowances!!! Thats okay, they will grow into them! 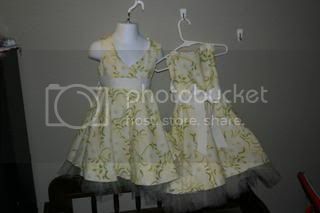 The dress itself is fully lined so it alone too 2.5 yards… then for each dress I cut 2 yds of tulle I had in my stash into 8″ strips & gathered them on my serger to make the tulle ruffle on the underskirt… I am just in LOVE with these dresses! So they used 4.5 yards EACH! 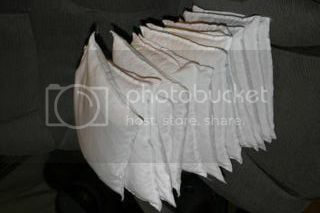 Not cheap since I used the good fabric for them, but well worth it! 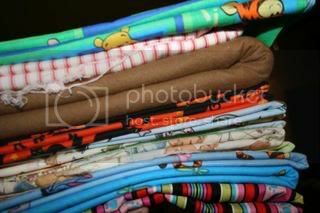 FINALLY 16 Flannel & Terry Diaper soaker’s!!! I ran out of disposable ones & can’t buy then anywhere with in an hours drive SO I dug out the white flannel I bought 2 years ago for my son… got on the web, found a tutorial & went at it! I figure with 8 each for the twins they should be good since we only use them at night. I just have to remember not to use fabric softener on them!!! 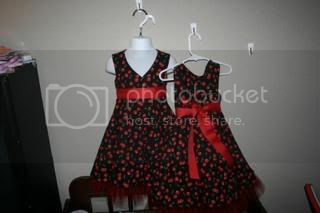 Beautiful little dresses! Great choice of colors. 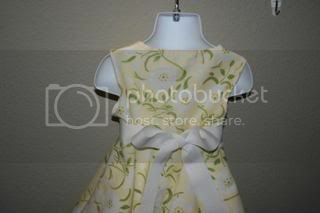 I would love to give sewing a try, but I just don’t have much patience for anything other than “fast” projects. Anyway. . . lovely! 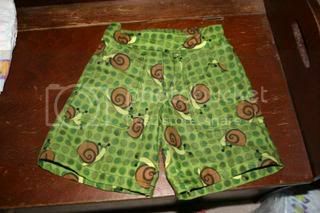 Hey it’s Angi from SNOMOMS, can you share the pattern for the boys shorts? 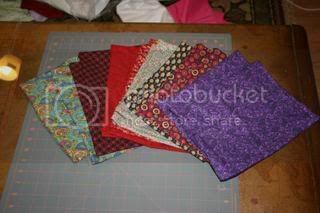 I love the squares and have some scraps I’d like to use up and those shorts are adorable! Any other ideas for boys? Mine are 4 and besides pajama pants I’m at a loss! 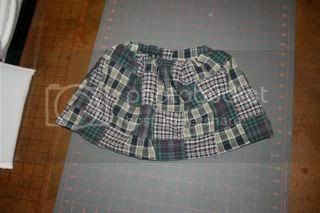 I’d love to make my daughter (15 months) and my son (30 months) matching skirt and shorts… do you mind sharing the patterns for the boy shorts and twirly skirt? Christina, both are self drafted patterns (patterns I made up). 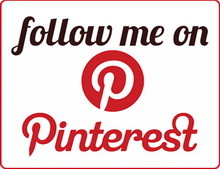 would you mind to share your skirt and shorts pattern? I cloth diaper and find it really hard to find shorts patterns that fit her!